The growing popularity of physical training for women - How a gymnasium girl gets health, strength, and pleasure from bars, bells, and ladders. The hands of the clock were pointing to nine, one morn­ing, a few weeks ago, at a well known gymnasium for wo­men in a New England city. The gallery that runs around the main hall of the building showed here and there the expectant face of a visitor. Below, the jani­tor was busily arrang­ing dumbbells, flying trapezes, and ungainly wooden horses, while the professors talked over their plans for the day. From an inner room upstairs came the babble of girls' voices. There was a general air of healthful, pleasant activity. Presently a bell sounded, the babble of voices ceased, and a long line of red cheeked, well built young women stepped in single file down the winding stairs. With a courtesy to their instructors they marched into the training room, and stood there in readiness for their morning's work. The girls, twenty-five in number, were arrayed in typical gymnasium suits - loose blouse waists, low at the throat, and generally finished off with a neat sailor collar, fastened with a knotted bow of ribbon. Their dark blue divided skirts reached only to the knee. The visitor could not but be im­pressed with the healthy freshness of their faces. It was surprising to learn that several of these plump, round throated, fresh com­plexioned girls had passed their thirtieth birthday. 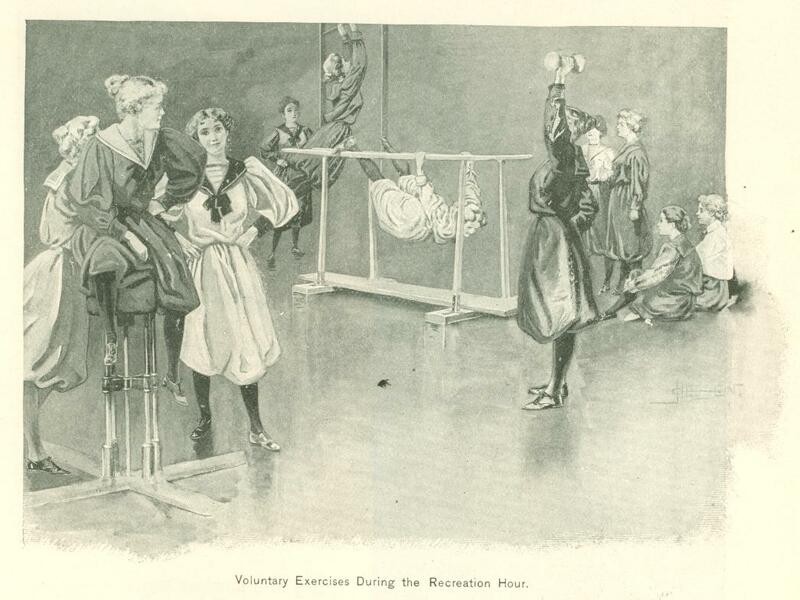 Their average age was twenty-five, but they seemed like school girls, so full were they of good spirits, so enthusias­tic was their interest in the exercises that formed their daily routine. They composed the two advanced classes, the "seniors" and "juniors." "Fa1l in!" cried the instructor, and in an instant the girls were drawn up in as straight a line as the best drilled veterans ever made. Up went their heads, firm and erect, chests were arched, heels set together, toes pointed at the regulation angle, arms and hands close to the side. This was the beginning of the "setting up drill," as it is called at West. Point. As the first note of a lively march sounded on the gymnasium piano, they entered upon a series of military evolutions, making intricate movements with a skill - and accuracy that would put to the blush many a body of masculine performers. 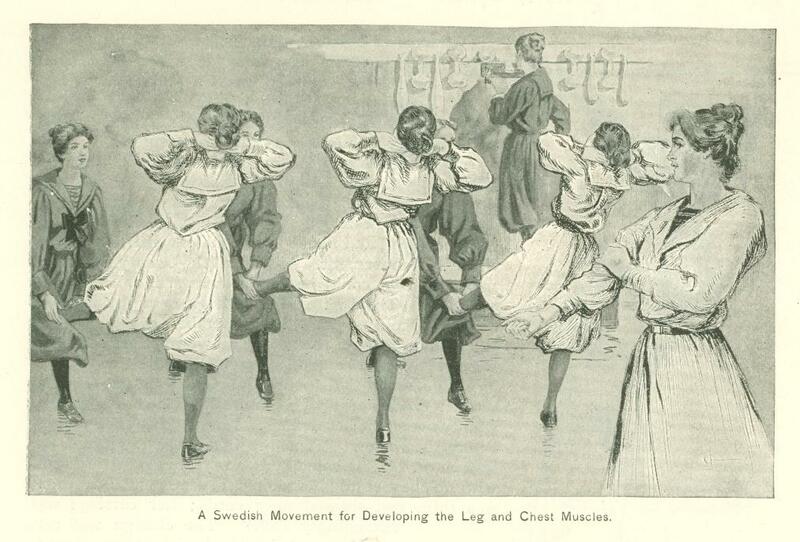 These exercises lasted about ten minutes, and were followed by an hour of light gymnastics. The girls took up dumbbells and wands. One golden haired, pink cheeked pupil preferred a pair of clubs, which she swung over her head and about her shoulders with a graceful freedom of movement. Among all the twenty-five, there was none that could be called awkward, or lacking in self poise. There were different degrees of physical per­fection, of course. At least ten members of the class had the lissome grace of the proverbial young deer; the rest were at least up to a good average standard. It is claimed that by faithfully carrying out the pre­scribed course of drill a naturally awkward girl may wholly overcome her defects. A living instance was set before the writer. "You see that girl?" inquired the instructor. "She came here two years ago, pale faced, with no chest at all; her shoulders were bent, her throat was thin, and showed ugly cords; her carriage was exceedingly bad. "The change was cer­tainly remarkable, for her chest was arched, her throat round, her bearing erect; and the glow that the morning's exercise had brought to her cheek made her a very pretty girl instead of a "horrible example." No woman can be beautiful without a good figure; and what woman does not wish to be beautiful? If all American girls knew what a gymnasium course can do for them, how it can strengthen and develop the body, how it can add to their enjoyment of life and their attractiveness, there would not be enough schools in the country to accommodate the throngs that would apply for membership. Beauty is but skin deep, it may be objected; but the adage does not apply to the sort of beauty that comes from three years of first rate physical teaching. It is an education that goes far deeper than the skin. It brings health - for a well developed figure means a body with healthy functions; it makes existence a happiness instead of a burden; it touches the moral life, and gives the mental soundness that comes from physical soundness. After the lighter gymnastics came an in­termission of ten minutes. during which the girls strolled about, chatting merrily, or sat upon the horses and bucks, their feet swing­ing back and forth, with the gaiety of school children at recess time. Then came the heavier work, which took another full hour. 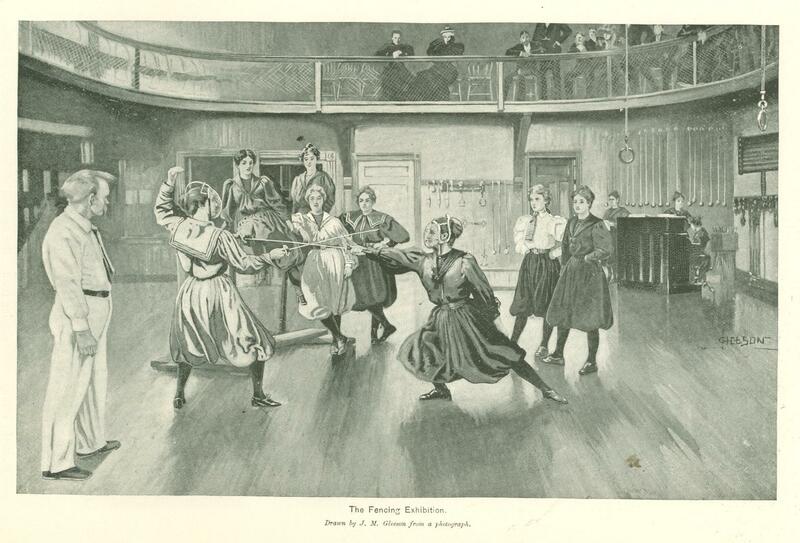 A showy movement, and one that was a favorite with some of the girls, was a journey around the hall, clinging to iron rings at the end of long ropes that hung down from the ceiling, and swinging from one ring to the next. Ladder climbing was another exercise, and to this the instructors attach special value as a developer of lungs and muscles. 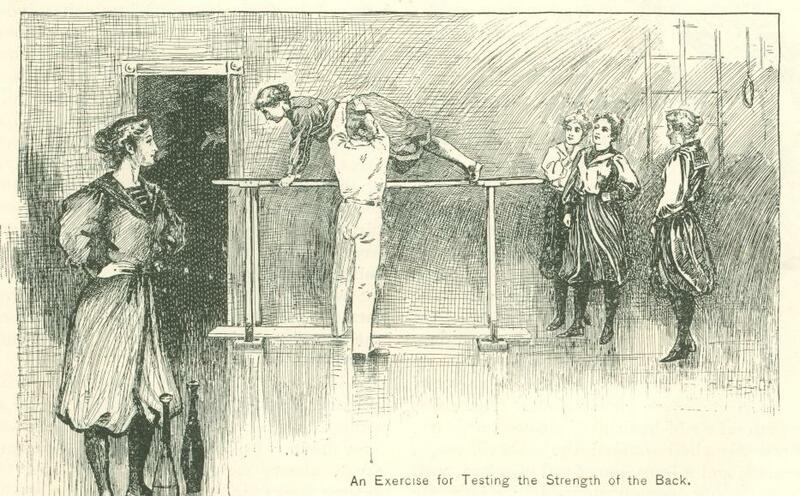 A back strengthening exercise, which to the spectator seemed almost cruelly tax­ing, was gone through without the slightest sign of reluctance or fatigue. Each girl in turn was ordered to hold herself up from the parallel bars, supporting herself en­tirely upon the tips of her toes and the palms of her hands. 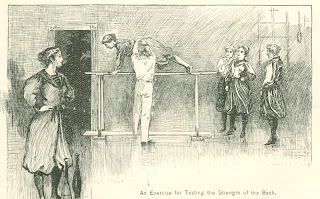 While in this position, the instructor would test the strength of her muscles, pressing down forcibly upon her shoulders and back. Some of the pupils endured five or six minutes of it with no apparent inconvenience. They seemed as rigid as bars of steel.. The bending back exercise, for developing the mus­cles of the chest, was another move­ment that looked trying but evidently was thoroughly enjoyed. At the close of the regular routine of the morning, two girls were allowed to give an exhibition in fencing. It was a remarkable display of skill and agility; thrust and parry fol­lowed each other with almost dazzling speed, the combatants seem­ing as much in earnest as if they were belted knights fighting upon the field of honor for the favor of some fair lady who stood in the admiring group that surrounded them. The movements of their bodies were the acme of grace and quickness, and their wrists appeared to have an astonishing degree of strength. Last of all, the class was marched to the lecture room, where for another hour instruction in anatomy was given. One minor point to which attention was paid was the taking of measurements - of height, girth of chest, and so forth; not that this is of value in itself, but because an understand­ing of it is needed by those pupils who are fitting themselves to he come instructors. This ended the routine of the morning. 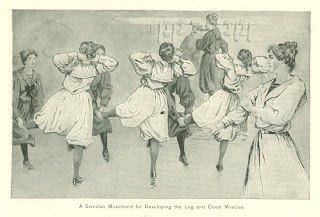 On the other days of the week, besides a re­petition of many of the same exercises, les­sons are given in dancing, both plain and fancy steps; there are lectures on various subjects, and special tasks are set for indi­vidual students. There are also classes for the medical students - girls who are being treated for curvature of the spine and simi­lar physical defects. Patients have been brought to the institution by an attendant, and have left it, after two or three years' treatment, entirely cured. Fashion is not always allied to common sense, but she never was wiser than when she decreed the downfall of the helpless sentimental heroine of a former day, and set up in her place, as the ideal of woman­hood, the healthy modern girl who frankly admits that she has arms and legs, and who knows how to use them. The typical so­ciety belle is no longer languid, lily-like, and quickly passee. She is a robust, strong limbed girl, who has no idea of fading even when she finds herself surrounded by girls of her own, who will learn to jump bars, swing clubs, and climb ladders, as their mother did before them. Originally published in Munsey's Magazine. September 1896.